A few years ago a friend and I realized that we both loved singing but didn't do much of it. So we started a weekly acappella group with just four members. After a year we started inviting other people to join. We didn't insist on musical experience — in fact some of our members had never sung before. Now the group has ballooned to around 15 or 20 people. The critical thing turns out to be the choice of songs. The songs that seem to work best are those based around the basic chords of blues and rock and country music. You want songs that are word-rich, but also vowel-rich because it's on the long vowels sounds of a song such as “Bring It On Home To Me” (“You know I'll alwaaaaays be your slaaaaave”), that's where your harmonies really express themselves. And when you get a lot of people singing harmony on a long note like that, it's beautiful. 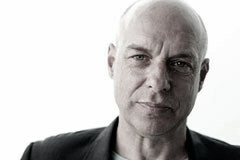 British composer, artist and activist, Brian Eno was a founding member of the rock group Roxy Music, and has produced recordings by Talking Heads and U2.